LAKE FOREST, Ill. – As much as Marc Leishman has been through, especially off the golf course, it takes a lot to get to get under his skin. He tells his wife that even after a particularly bad round, give him 10 minutes and he’ll be fine. His last tournament, when Leishman lost a two-shot lead on the back nine at the TPC Boston, was an exception. 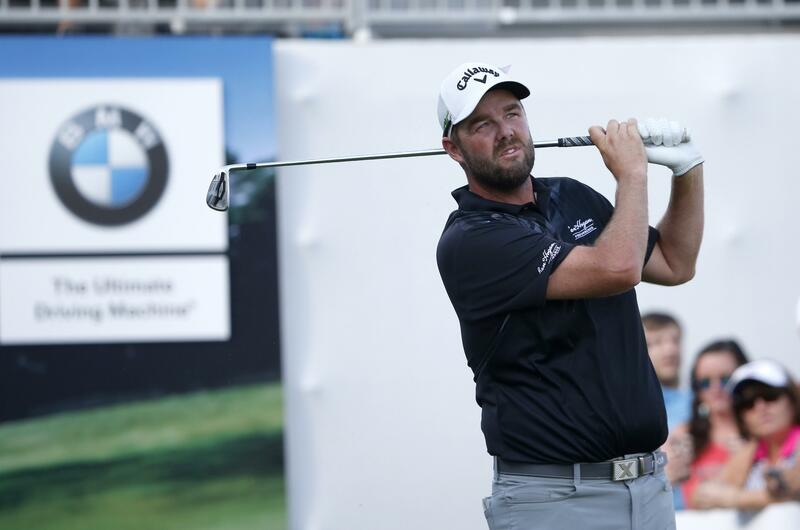 Saturday at the BMW Championship brought Leishman on the verge of redemption. Leishman got up-and-down from a tough lie behind the 18th green for one last birdie that gave him a 3-under 68 and extended his lead to five shots over Jason Day and Rickie Fowler going into the final round at Conway Farms. Leishman, who was at 19-under 194, gets another chance to win a FedEx Cup playoff event and grab one of the top five seeds at the Tour Championship next week. The top seeds have a clear path to claim the $10 million bonus. And this opportunity is much better than two weeks ago. Leishman shared the 54-hole lead at the Dell Technologies Championship TPC Boston with Justin Thomas, who surged past Leishman and held off Jordan Spieth. This time, no one could make a run at him on a warm day with a steady wind that made conditions faster and more difficult. Fowler rolled in a 25-foot eagle putt from just short of the green on the opening hole, and made only one birdie the rest of the way. He missed putts from the 6-foot range on consecutive holes on the back nine, one of them for birdie, and couldn’t make birdie with an iron in his hand for his second shot on the par-5 18th. Day pulled within two shots with a birdie at the turn, but played the back nine with eight pars and a bogey. He also had an iron for his second shot on the 18th, but it plugged into the side of the bunker. Fowler and Day each shot 70. The excitement figured to come from the race to East Lake. The top 30 in the FedEx Cup advance to next week’s Tour Championship, where all have a mathematical chance at the $10 million bonus and are assured spots in every major except the PGA Championship next year. Phil Mickelson, finally finding his form late in the year, has a chance to make it to the Tour Championship. He had a 69 – his seventh straight round in the 60s – but failed to take advantage of the easiest par 4 at Conway Farms – the reachable 15th – and took bogey on both par 3s. Going into Sunday, Masters champion Sergio Garcia and a pair of PGA Tour rookies, Mackenzie Hughes and Patrick Cantlay, were projected to get into the top 30. Still in the mix is Stewart Cink, who next week during the Tour Championship receives the Payne Stewart Award. Cink at one point was projected inside the top 30 until closing with a pair of bogeys. Just like everyone else, there’s one more day. The race for the BMW Championship title has fewer possibilities. Justin Rose had a 66 and was alone in fourth, though he was seven shots behind. Jon Rahm of Spain had a 65 and joined the large group at 11-under 202 that included Cantlay, Matt Kuchar and Charley Hoffman. It would cap off a big week for Leishman in other ways. His wife, Audrey, nearly died two years ago from toxic shock syndrome. She eventually recovered, and this year gave birth to a daughter, Eva, their third child. To recognizes Sepsis Awareness Month, Leishman arranged for players to wear ribbons on their caps. “That’s what took Audrey ill to being with, and we’re just trying to get an awareness out there,” he said. He created the “Begin Again Foundation” to help families that have gone through tough times with sepsis and toxic shock syndrome, and already have helped 700 families. Leishman is sure to get plenty of attention with a wire-to-wire victory at the BMW Championship. Now he just has to finish. “After what happened at the Dell I got extra determination to finish this one off and my game is in a better spot,” he said. Published: Sept. 16, 2017, 5:53 p.m. Updated: Sept. 16, 2017, 5:56 p.m.